Podere Palazzo is less than two hours north of Rome and about one and a half hours south of Florence by car. From both major cities it is an easy drive on the A1, the main north-south highway. 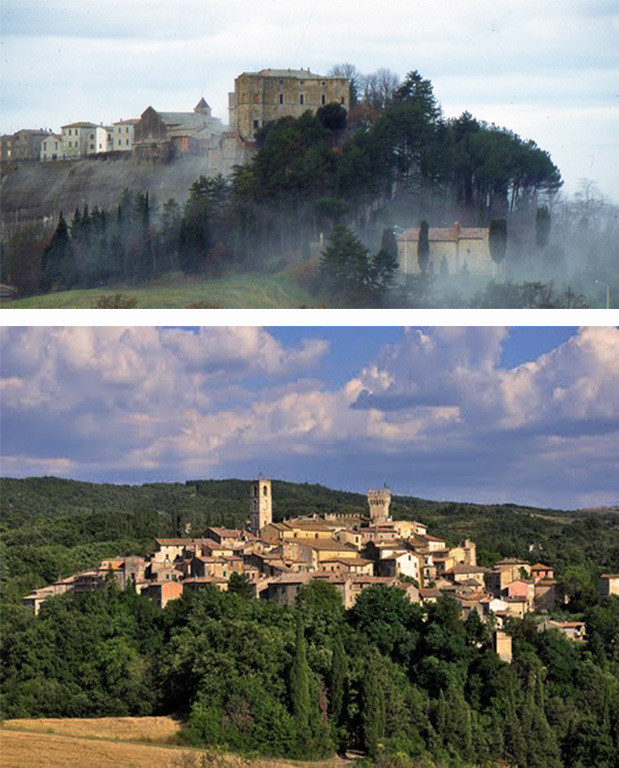 It is also about an hour from the major cities of Siena and Perugia, both of which have airports. In addition, Podere Palazzo can be reached by train from Rome or Florence. The closest stop is Fabro, which is about 20 minutes from the house, but if you want to rent a car you should use Chiusi or Orvieto which are both 30 minutes or so from the house. Once you are at Podere Palazzo, you are close to several charming villages and towns that provide amenities that will make your stay most enjoyable. Here are a few to enjoy. Trevinano, which can be seen from the house sitting atop a tufa rock at the north end of the valley, is a hamlet whose size does not do justice to its long history. It has two wonderful restaurants, the homey Trattoria Gianfranco and the ambitious La Parolina. It also has a little grocery store (alimentari) open part time and a small convenience store. There is a spectacular view of Podere Palazzo as you look back down the valley. San Casciano dei Bagni put this area on the map in recent years and is a charming town known for its baths which produce the largest volume of thermal water of any in Italy. In the newer part of town there are various shops and a bank with ATM machine, as well as the delightful restaurant, La Fontanella. In the older part of town, further down the road, there are narrow medieval streets to explore along with shops for food and produce, a wine shop, a small convenience store (tabacchi), bakeries and more. On the lovely piazza with a beautiful view of the valley below, you will find Daniela, one of the best known restaurants in the area. 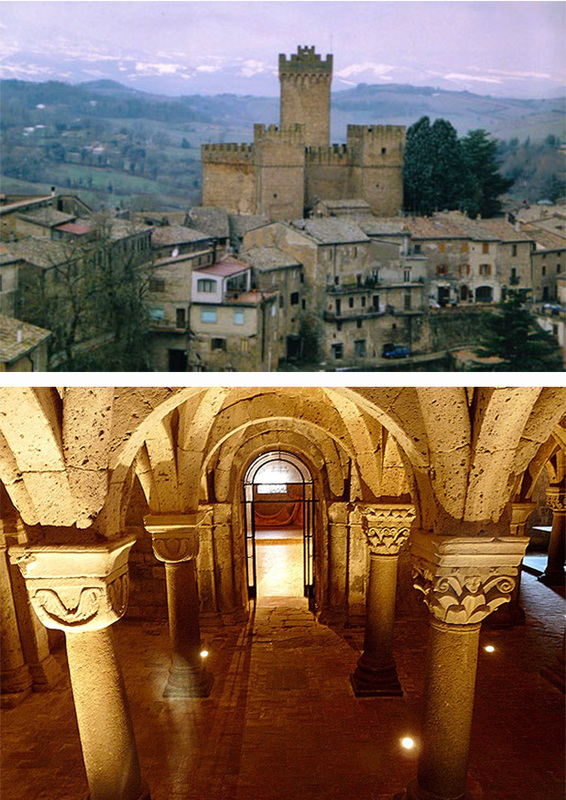 San Casciano also boasts one of the best spas with Thermal waters in the region: Fonteverde. By contrast, Proceno is a sleepy, undiscovered village that you can see to the south from the house, and is a good spot for an ice cream or a pizza in the evening and a quiet stroll. It has a lively piazza with an adjacent playground for children and nice views across the valley. It also has shops for food and produce near the castle. A pleasant ten minute drive south brings you to Acquapendente. Although it has only 5,000 inhabitants, Acquapendente is a regional center and offers you the experience of a typical Italian town. Dating back to the Etruscans, it gained fame as one of the last stops along the Via Francigena, the pilgrimage route from Canterbury to Rome. Today Acquapendente still welcomes travellers and has everything you will need during your stay at Podere Palazzo. If you follow the main road, you will find supermarkets, gas stations, and a very good tourist office. If you park along the old city walls, you can walk into the old city center with its busy main square. Here you can find bars, banks, small grocery stores, bakeries, butcher shops, fresh pasta shops and delicious ice cream. On Friday there is a market at which a wide variety of local produce, fresh cheese and other goods are available. In addition, there are historical sites to see and several good restaurants.